Shadow Woods Metal Fest Announces New Dates, New Location, Lineup Changes! The 2018 edition of Shadow Woods Metal Fest (aka Shadow Woods IV) had hoped to debut this year’s fest in a new location in Virginia, but it was not to be. The festival will return to the original Maryland location, Camp Hidden Valley. Due to changes in dates and venue, changes to the festival line-up had to be made. 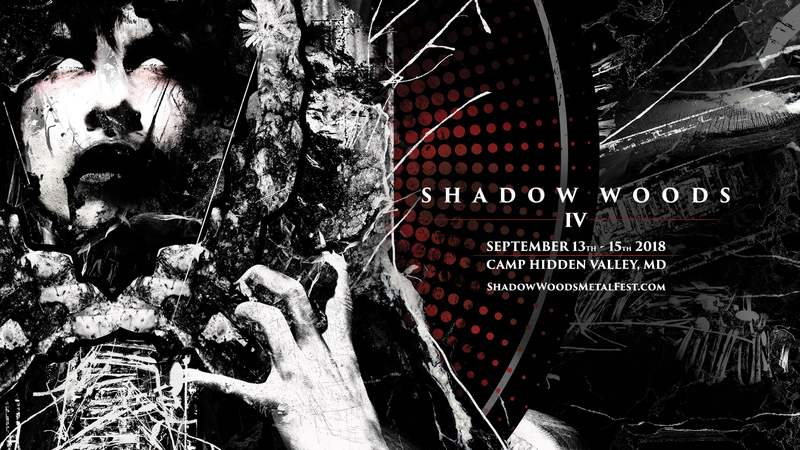 Shadow Woods IV will now be held Sept 13-15, 2018 at Camp Hidden Valley (located at 4722 Mellow Rd. White Hall, MD) so that the fest could be presented in the manner that attendees have come to expect. With the date change, however, come expected lineup changes and the addition of a post-fest concert to honor the original performance date of those bands who could not reschedule.. All previously issued tickets will be honored for the new dates. Refunds will be given upon request by emailing Shadow.Woods.LLC@gmail.com. Here’s what’s new: UADA and PANZERFAUST will no longer be able to play the fest; they will play the post-fest show on September 22 at The WindUp Space in Baltimore, along with IMPERIAL TRIUMPHANT and two past fest favorites NIGHT RAIDS and DARK WATER TRANSIT. Tombs will also not be able to play the fest and were not able to play a rescheduled event. The remainder of the Shadow Woods IV lineup remains remarkably unchanged, and three new bands have been added. As in previous years, Camp Hidden Valley will feature three alternating stages, this time it will be Woodland, Pavilion and Hall. SHADOW WOODS METAL FEST, the Mid-Atlantic’s only open-air camping heavy metal gathering, is pleased to announce the complete and updated lineup for the 2018 festival, which runs from Thursday, September 13th through Saturday, September 15th in White Hall, MD at Camp Hidden Valley.